You want to change something? You don’t know where to start? In this article, we present a powerful tool that can help you quickly identify what is causing a problem and how to move on from it. This tool is the NLP logical levels model. The logical levels model is a very helpful tool for personal change in that it gives a framework for identifying why things happen the way they do. The model assumes that the processes of learning, problem solving, sensory processing, change, and communication occur at six different hierarchical levels. 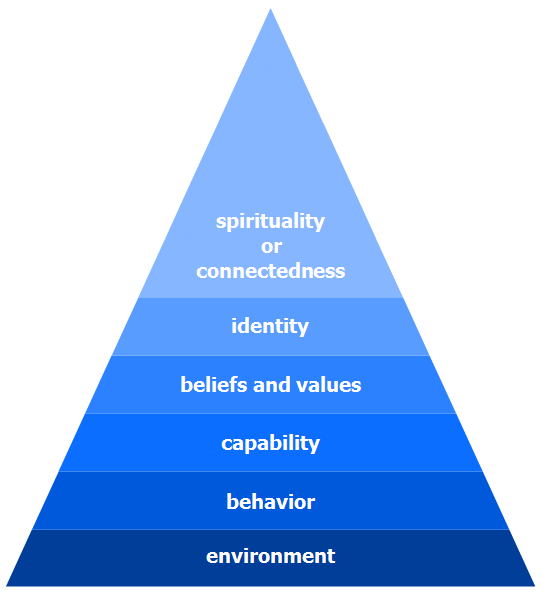 The logical levels model is built up of the following six stages: environment, behavior, capability, beliefs and values, identity, spirituality or connectedness. Take a look at the chart below. The hierarchy of the six levels can be represented as a pyramid in which all levels are related to each other. The respective position of a given logical level becomes important for the realization of sustainable changes. Making a change at a lower level may, but not necessarily, affect an upper level. However, a change at an upper level will have a distinct impact on the levels below it. In other words: Whatever is on top runs everything underneath. 1. Environment: Where do I need to change? This level refers to the physical and emotional environment around us such as the community, our living arrangements, the people around us, the tools and resources available to us, the culture of which we are part. To access this level, ask yourself: How does my environment affect my goal? What are my external opportunities or constraints? What kind of people do I like to have around me? Where do I gain support from? Where are my resources? How does my working environment make me feel? 2. Behavior: What do I need to change? The second level refers to the action and behavior of a person. How does a person act or react in a given situation? What are the physical signs in terms of body language and voice? What are the habits? What is the current lifestyle? Are they any patterns? 3. Capability: How do I make these changes? This level is about the abilities, skills, talents, knowledge, and competencies that we have and which lead to a series of action and behaviors. What are the skills and abilities that we currently possess that will help us get the changes we want? Which skills we need, but have not yet learned in order to make the needed changes? 4. 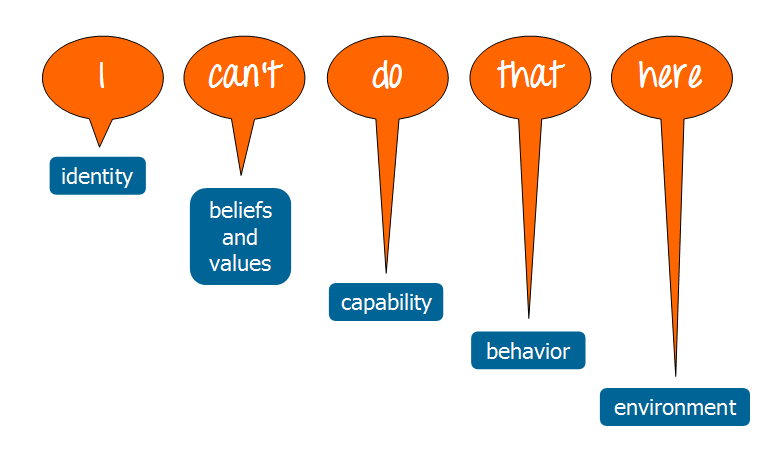 Beliefs and values: Why do I make these changes? Beliefs and values drive behaviors. They provide the primary motivating force behind our actions and capabilities and have, therefore, a massive impact on our outcomes. They define who we are and direct our lives. Yet often we are not even aware of them. Useful questions to access this logical level are: What is important to me? What do I believe and value? Why do I believe and value that? What do I believe to be right and wrong? What beliefs might help me you get better results? 5. Identity: Who am I and do I reflect that in the way I live? Identity is our sense of self, our core beliefs and values. This level can be summed up by the questions: Who am I? How do I think about myself? What I stand for? What is my vision of life? How is what I am experiencing an expression of who I am? How would others describe me? 6. Spirituality or connectedness: Whom do I serve and for what purpose? The highest logical level deals with the big picture of life, when we begin to question our own purpose, ethics, mission, or meaning in life. Asking the following questions helps us to get a glimpse of your purpose in life: What is my meaning in life? For what reason am I here? How would I like to be remembered when I am gone? What greater good do I believe in? The following sentence highlights five of the key levels. Where the person emphasizes a word will often bring out, which logical level need to address to take action. “I can’t do that here” – Emphasis on the identity level: Who could do the job? What could I do? I love the “I can´t do that here” -idea for Logical Levels You wrote in this article. I should have found this information before I published my post where I´m testing Logical Levels for prioritizing sleep in my alternative lifestyle blog. Anyways, I´m happy to see this info now and I will definitely use it in the future. So thank you for a great article.